I can’t remember what I did on Monday. It could realistically have been nothing, as Longs Peak last week seemed to really take it out of me. Getting some strength back, but still amazed at how walloped I was from Longs. Remember getting a V6 fairly easy on the arete of the 45 degree wall and not being about to get a V5 just to the left of it. The V5 had an undercling that my hurt finger did not like, so although close, I had to call it on that problem. The weather was just too good to stay inside, so I ventured out with my scramblin’ shoes to see if things were dry enough yet to play on. As usual, I started on the Second via Freeway and found myself 100% solid, so made the decision to take on Free For All instead, which is a longer, harder route. That felt great as well, so I extended my scramble just a bit by getting on Bakers Way on the First, before heading up to tag the summit of Green. On my way down, I then downclimbed Freeway. Another day, another scramble. Nolan and I began on the Direct East Face of the First, then I showed Nolan the route I’m putting together called, “I Bleed“. 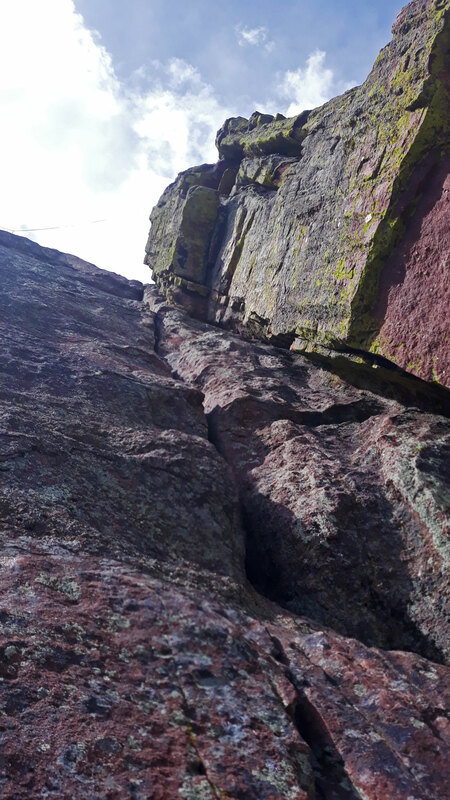 If you’re (the 2 or 3 people who read this that could possible be) familiar with the start of the Tangen Tunnel route, this route has a similar flavor of burrowing into a Flatiron, rather than climbing on the face of one, except that the difficulty level is much more committing. We finished on the summit of the Second, then downclimbed the Pullman Car to suss out another route called, Freezeway from above its crux. Looked difficult. Regardless, I wanted to get to the base of the crux pitch, and try the moves. Surprisingly, it went, and I didn’t fall (that’s a nice surprise, indeed), so I sumitted the Second for the second time, and we called it good for the day. Good sess., although not very structured (which isn’t a bad thing or anything). Certainly feeling the day before. 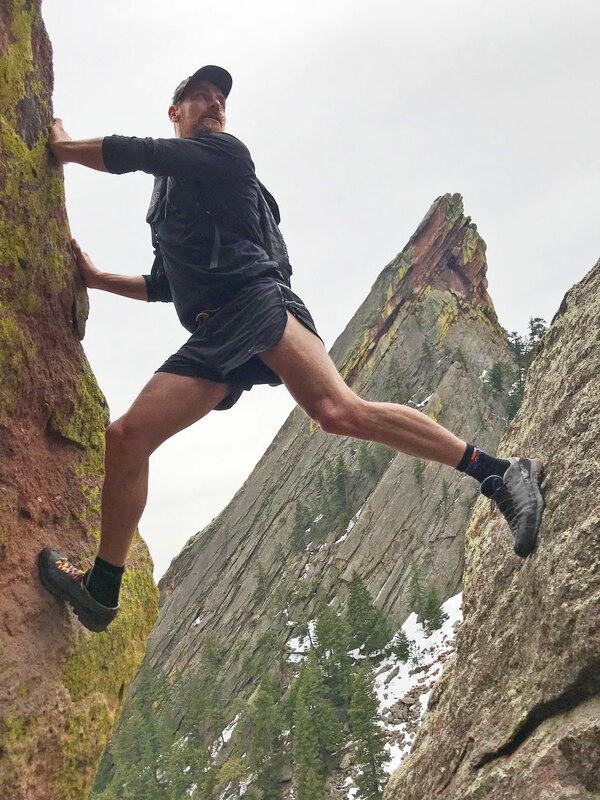 More Flatiron romping – why not? Arms felt very sore at this point, so I again started on Freeway, and I truly though that was going to be it for me. Freeway was a zoo (it being a beautiful Saturday), so I again quickly exited off onto Free For All, and finished up on that. Seemed natural to extend Wednesday’s sess, so I began on Bakers Way, and pulled the crux to get on the face, but then started up the second pitch of Fandango, and summited the First via this wonderful route. Really beautiful position, and no crowds that I knew would be on the standard route. Afterwards, I did a quick scramble of Chase the Sun, then went back to I Bleed, then Freezeway, finally finishing my scramble with Pack Rat, before tagging Green. Descended via Long Canyon to get a bit more mileage out of the day. Was going to ride up Flagstaff, but rain threatened, and I thought I should save my legs for tomorrow, anyways. Nice ride and good time – probably my fastest time yet. Thought about switching out my front ring from a 42 to a 46, but laziness prevailed. Minor route difference: stayed on Wilson, rather than turn onto Taft. That simplifies the route a bit, and saves you from a few stoplights. Quick sess. at the FoCo climbing gym. Got on one 5.12-, and was able to TR is fairly easily.